It’s Time D-Heads! 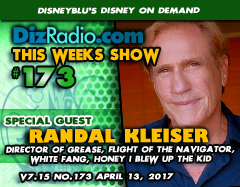 This week we celebrate Easter by welcoming RANDAL KLEISER (Director of Grease, White Fang, Honey I Blew Up the Kid, Flight of the Navigator, Big Top Pee Wee, Blue Lagoon, Honey I Shrunk the Audience and more) to the show! Randal stops in and talks about his famous movies, favorite scenes, upcoming projects, working for Disney and so much more! In addition no show is complete without the D-Team and you have the questions and Erin has the answers in I Want To Know while Jason goes deep into The Vault with another Blu-Ray and DVD you have to add to your collection. Let’s not forget the symphony for your ears with Paige in the Magical Music Review while Domenic gives you those tip in this week’s Short Leash. And Randy brings you the latest in Disney Multi-Media! There is news fresh off the D-Wire with the latest news from Star Wars Celebration, The Magic Kingdom, Walt Disney World, Animal Kingdom, Disney Channel, Raven’s Home, Disney Junior, Puppy Pals, Star Wars Force of Destiny, and so much more!